The satellite-launching craft will work much very like SpaceX's Falcon 9. 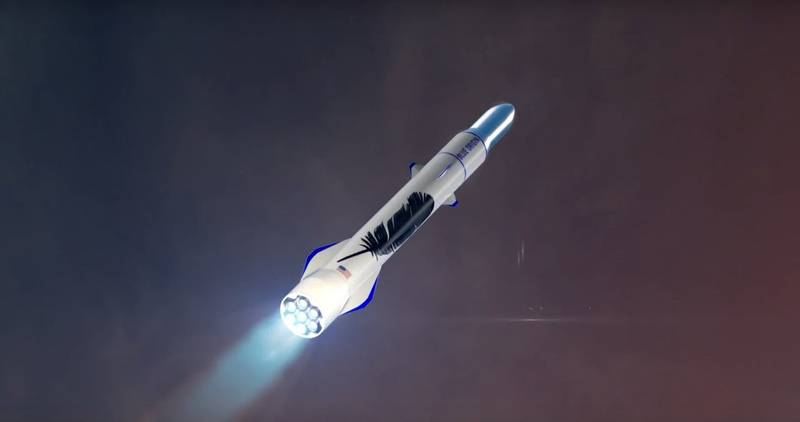 Yesterday Blue Origin showed off the BE-4 engine for its "New Glenn" rocket, and today CEO Jeff Bezos revealed its launch customer and an animation showing how it'll fly. Its new ship is capable of putting a 50-ton payload into a low-Earth orbit or 14 tons in a geosynchronous orbit and then landing the first stage on a moving barge (video, below). That's nearly identical, of course, to what the SpaceX Falcon 9 can do. Blue Origin has also landed the New Shepard's first stage multiple times (on land), but it's not an orbital-capable rocket like the Falcon 9. At the Satellite 2017 event in Washington DC, Jeff Bezos also revealed that the New Glenn's launch customer with be Eutelsat, a France-based TV, corporate network and mobile communications provider. Blue Origin will launch geostationary satellite for the company sometime in the 2021-2022 timeframe, Eutelsat said in a press release. Bezos said that the company's overall goal is to reduce launch costs via reusability, much like SpaceX. New Glenn will come in two versions -- the one shown in the animation will be a two-stage vehicle that uses multiple BE-4 rockets. Blue Origin will also build a three-stage version that could launch the company's "Blue Moon" cargo lander to the moon. None of the rockets will take off until at least 2020, however. The take-off, flight and landing sequences shown in the animation do bear a lot of resemblance to what SpaceX does, especially the part about landing on a barge. However, Blue Origin was actually the first company to land a reusable rocket, albeit a much smaller one, with the New Shepard. There are also some significant differences between the vehicles, most notably the aerodynamic control surfaces used to help guide New Glenn's first-stage in for a landing. Reportedly, that negates the need for a re-entry deceleration burn.